Affordable housing – There is always a good selection of affordably priced manufactured homes for sale at our community. Click on “Our Homes” link above or contact our Lifestyle Team for an up-to-date listing. A wealth of amenities – Our 55 plus community features a number of amenities that make it easy for residents to stay active and have fun. These include a large outdoor pool that’s heated, a hot tub, courts for playing tennis and pickleball, a fitness center, a Bingo hall, a banquet hall, a woodworking shop, and shuffleboard courts – just to name a few. Lots of activities – At StrawBerry Ridge, there is just about always some kind of organized activity going on. Just look at our Activities & Event calendar! 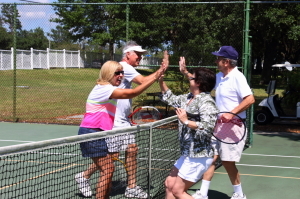 Popular activities include ceramics, cards, art guild, shuffleboard, and aerobics. A great location – Ask any residents of our 55+ community what they like most about living at StrawBerry Ridge and they will likely cite location as one of many reasons. We are just a short drive away from quality retail shopping facilities, good medical care, busy transportation hubs (e.g., Tampa International Airport and the Port of Tampa), and a wide array of cultural attractions. For additional information about StrawBerry Ridge and details on how to become a resident of our lovely 55 and over community near Tampa, FL, contact us today.